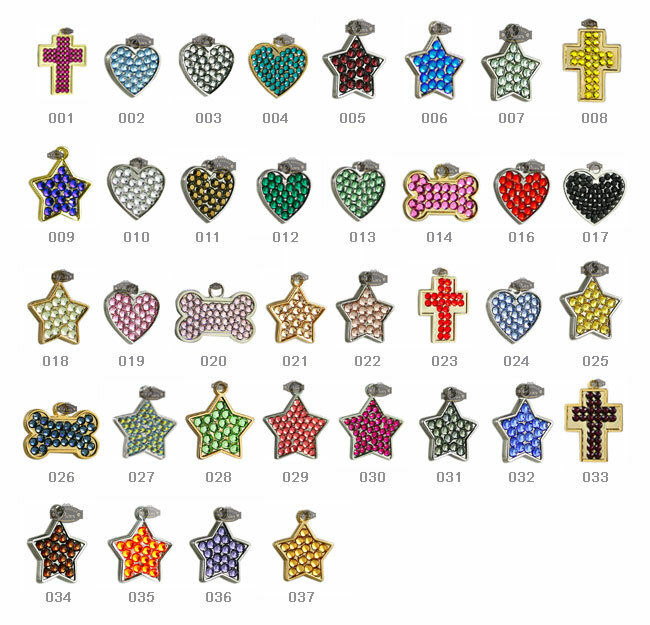 ID charms combine a thick, yet lightweight metal alloy charm finished with either 24K gold or pure silver and are handset with Standard Swarovski crystals in your choice of amazing colors. From the leader in pet id jewelry, Park Ave Paws fine id charms combine a thick, yet lightweight metal alloy charm finished with either 24K gold or pure silver and are handset with Standard Swarovski crystals in your choice of over 30 colors. These crystals are more saturated in color than the AB crystals. Also included is up to four lines of custom engraving, using a diamond tipped engraver. This all makes for a very unique and absolutely beautiful id sure grab anyone's attention. It did not like at all. I ordered a large which is only 2-1/4 inches but this one barely measured 2-1/8 inches. This tag is so small I had a hard time finding it in the package. It took a long time to receive it. I will not be ordering anything from this company in the future. Click the button below to add the Swarovski Crystal Pet ID Tags to your wish list.